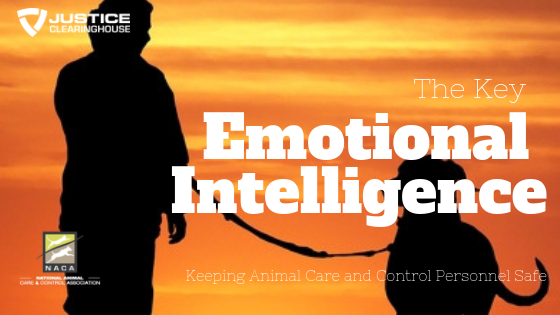 Emotional intelligence, or the ability to understand and control emotions, is a quality needed by all animal care and control employees. Study after study shows high EI has been positively correlated with job performance and satisfaction, stress management, social interaction and ability to identify emotional expressions. While there has been no specific research to explore the role of EI in the animal care and control profession, common sense would suggest that workers with high IE would be more likely to connect and communicate successfully with the public they serve. Dealing with the public and their companion animals can be a very emotional situation. Many of people who animal care and control workers have to deal with often feel extreme emotions such as fear and anger. They can be in a situation where they feel they have no control over what happens to them. These feelings will often be expressed towards the animal care and control worker who should not take expressions of emotions, such as anger, directed at them personally. Animal care and control workers are empathetic and also vulnerable to burnout. They must find ways of protecting themselves from taking on the stressors of the public they serve learning how to become more emotionally intelligent will help and deal with these high-stress situations and help keep them safe!